Kurlee Belle: Does Natural Hair Make You Look Smarter? Like all things uncommon, there is a certain stigma attached to women who wear their natural hair or an afro. While walking through, the Nassau Straw Market (tourist attraction in Nassau, Bahamas) many of the vendors solicited my attention by calling me "Soul Sister". On another occasion, while having drinks at a bar with a friend, a lady walked in with a very huge afro and one of the patrons at the bar held up their fist as to make the "Black Power" or "Black Panther" sign. Since I've been natural, men have approached me differently. Many of their pick up lines start with "I love your hair" followed by a bright smile. One guy even asked me "You must be really DEEP, since you wear your hair natural and all." I rolled my eyes at his comment as if women with straight hair are less deeper. While having a separate conversation with another gentlemen, he expressed his opinion of natural hair and that it was something that he admired. In his words "A women that is natural is truly confident because she is not afraid to reveal her unadulterated self to the world. And that is beautiful." There is something about natural hair that expresses to the world that you are comfortable with who you are and that somehow transcends into intelligence. Natural hair says that this women knows who she is, what she wants and where she is going. Women with natural hair are defying the norm and defining what is truly beautiful. 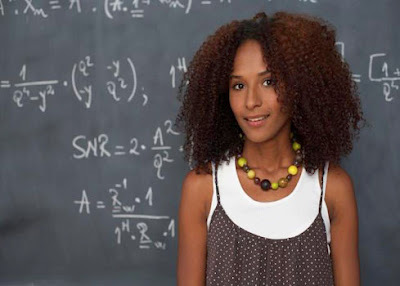 Do you think your natural hair makes you look smarter?